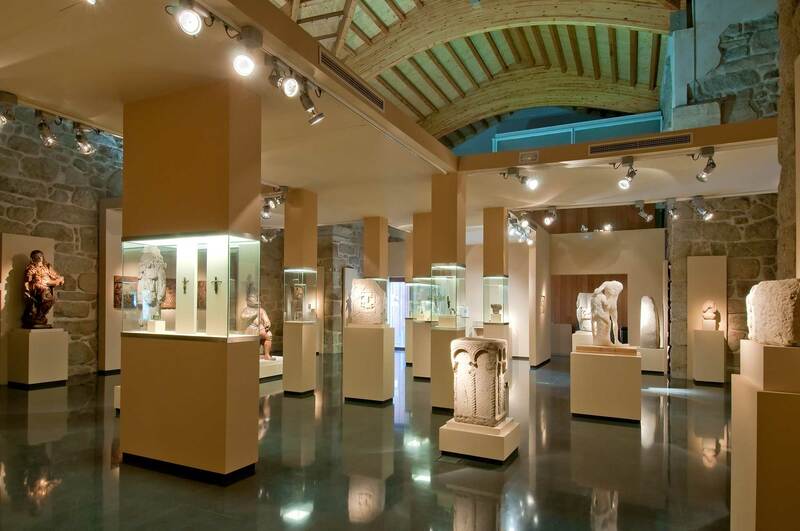 The permanent exhibition of the Provincial Archaeological Museum of Ourense is located in the ancient church of the Third Order, in the convent of San Francisco, situated in Granxa Street (Campo de San Francisco). Named 'Escola de Escultura' (Galician for 'Sculpture Selection'), the exhibition offers a chronological itinerary by the most representative collections in the museum, in a wide range of materials –stone, bronze, wood…- from Prehistory to Modern Age. Prehistory works stand out, such as the star of the Bronze Age: the Statue-Menhir of Pedra Alta, with an engraving depicting personal defence weapons and prestigious and powerful objects. Also stunning, the artworks belonging to Castro Culture: Gallaecian warriors and unique architectural elements, like the Triskelion of Castromao (1st century BC-1st century AD). The Romanization process of Gallaecia brought us bronze works, as the Tábula de Hospitalidade of Castromao and the Mercurio de Vilar de Bario. The exhibition continues with items ranging from the early years of Christianity to the Modern Aged, which is represented - among other artworks - by the magnificent Taboleiros de Coro, depicting episodes of the life of Jesus Christ and by created by Alonso Martínez Montánchez in the 17th century for the Santa María de Montederramo Monastery.